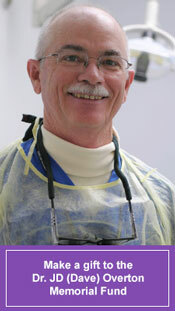 Dr. J. D. (Dave) Overton passed away April 20, 2013 after a long illness. Dave was the recipient of a number of significant awards. He received the University of Texas Health Science Center Presidential Teaching Award. He was selected as a member of the Academy of Master Teachers. On two occasions he was selected as Professor of the Year, an award given each year by students to the one professor who had the greatest impact on their education. Dave demonstrated extraordinary grace, perseverance, and courage under the most difficult of circumstances and he maintained his schedule at the dental school until weeks before his death. He earned the respect and affiliation of colleagues and students. He will be sorely missed. The family of Dr. Overton has requested that, in lieu of flowers, donations be made to the Overton Fund. Donations may be made through the school’s Director of Development, Patrick O’Hara, who may be reached by email or by telephone at 210-567-2575.